“Ho, Friend Buffalo, I challenge you to a fight! “he exclaimed in a small, squeaking voice. The Buffalo paid no attention, thinking it only a joke. The Mouse angrily repeated the challenge, and still his enemy went on quietly grazing. Then the little Mouse laughed with contempt as he offered his defiance. The Buffalo at last looked at him and replied carelessly: “You had better keep still, little one, or I shall come over there and step on you, and there will be nothing left! ” “You can’t do it! “replied the Mouse. “I tell you to keep still, “insisted the Buffalo, who was getting angry. “If you speak to me again, I shall certainly come and put an end to you!” “I dare you to do it! “said the Mouse, provoking him. Thereupon the other rushed upon him. He trampled the grass clumsily and tore up the earth with his front hoofs. When he had ended, he looked for the Mouse, but he could not see him anywhere. “I told you I would step on you, and there would be nothing left! “he muttered. Standing upon the body of the dead Buffalo, he called loudly for a knife with which to dress his game. In another part of the meadow, Red Fox, very hungry, was hunting mice for his breakfast. He saw one and jumped upon him with all four feet, but the little Mouse got away, and he was terribly disappointed. All at once he thought he heard a distant call: “Bring a knife! Bring a knife ! ” When the second call came, Red Fox started in the direction of the sound. At the first knoll he stopped and listened, but hearing nothing more, he was about to go back. Just then he heard the call plainly, but in a very thin voice, “Bring a knife!” Red Fox immediately set out again and ran as fast as he could. 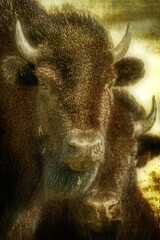 By and by he came upon the huge body of the Buffalo lying upon the ground. The little Mouse still stood upon the body. “I want you to dress this Buffalo for me and I will give you some of the meat,” commanded the Mouse. “Thank you, my friend, I shall be glad to do this for you,” he replied, politely. The Fox dressed the Buffalo, while the Mouse sat upon a mound near by, looking on and giving his orders. “You must cut the meat into small pieces,” he said to the Fox. When the Fox had finished his work, the Mouse paid him with a small piece of liver. He swallowed it quickly and smacked his lips. “Please, may I have another piece?” He asked quite humbly.